TWINS APART Astronaut Scott Kelly (left) spent a year in space on the International Space Station while his identical twin brother, astronaut Mark Kelly (right), remained on Earth. They were part of a landmark study to help researchers understand how space flight effects the human body. 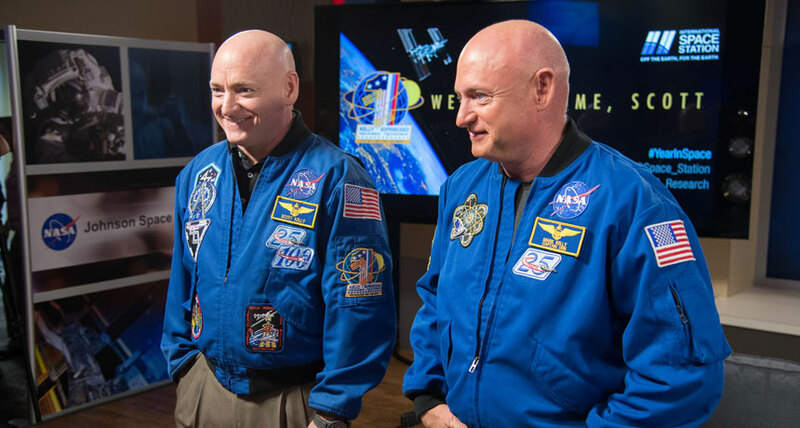 For nearly a year, U.S. astronauts and identical twins Scott and Mark Kelly lived lives that were as separate as Earth and space — literally. While Mark enjoyed retirement in Tucson, his brother floated in microgravity aboard the International Space Station orbiting about 400 kilometers above the planet. Ten science teams studied the twins’ physiology, memory abilities and genes before, during and after that year, looking for any deviations that might suggest Scott’s 340 days in space affected him physically. While researchers have dropped tantalizing hints about what NASA’s Twins Study found, now a comprehensive study published in the April 12 Science confirms that lengthy space travel triggers stressors that can manipulate genes, send the immune system into overdrive or impair mental reasoning abilities and memory. Whether these stressors have long-term health repercussions is still unclear. This is “the most comprehensive view that we’ve ever had of the response of the human body to spaceflight,” says Susan Bailey, a radiation cancer biologist at Colorado State University in Fort Collins who led one of the research teams. Within the first few days after Scott entered space in March 2015, he took blood samples that were sent back to Earth. Tests revealed epigenetic tags on more than 1,000 of his genes that weren’t in his preflight samples or samples from Mark. These chemical markers, which can turn a gene on or off when added or removed, can be caused by environmental factors and are reversible. Most affected were genes regulating the repair of DNA and the length of telomeres, the tips of chromosomes, Bailey’s team found. Measurements of Scott’s telomeres showed that they had surprisingly grown 14.5 percent longer. The team had expected to find his telomeres shortened amid the low-gravity and radiation-bathed environment of space. Within 48 hours of his March 2016 return to Earth (SN Online: 2/29/16), though, his telomeres had shrunk back to their preflight length. And several months later, some telomeres were even shorter, the group reports in Science. “That could be where he might be at increased risk,” Bailey says. The shortening of telomeres has been associated with aging and such health risks as cardiovascular disease or cancer (SN: 12/15/12, p. 13). Genes most frequently switched into active mode in those early spaceflight blood samples were those involved in regulating the immune system. That indicates that, while a body is in space, “the immune system is on almost a high alert as a way to try and understand this new environment,” says functional genomicist Christopher Mason at Cornell University. His group looked at what genes were affected by spaceflight. Scott’s chromosomes also went through many structural changes, another team found. Chromosome parts were swapped, inverted or even merged — changes that can lead to infertility or certain types of cancer. “These are natural, essential stress responses,” says geneticist Michael Snyder of Stanford University, whose group looked for shifts the twins’ metabolisms and proteins. Scott’s chromosomal changes were likely exacerbated by high-energy particles and cosmic rays in space, Snyder says. Most of the changes Scott experienced reversed to preflight state once he returned to Earth. But not all. For instance, roughly 91 percent of the genes that had changed activity while he was in space returned to normal six months later while the rest stayed in space mode. Six months after his return, his immune system was still on high alert, DNA repair genes were still overly active and, in addition, some of his chromosomes were still topsy-turvy. Tests of Scott’s speed and accuracy in short-term memory and logic problems showed that his cognitive abilities had declined from preflight levels. Whether these results are definitely from spaceflight is unclear, partly because the observations are from only one individual. “Bottom line: There’s a ton we don’t know,” Snyder says. More answers may come from upcoming missions. NASA in October funded 25 new projects that each could send up to 10 astronauts on yearlong space missions. But to really learn how the environment of space impacts human health, even longer trips are needed. A mission to Mars would take an estimated 30 months and go beyond Earth’s magnetic field, which shields against DNA-damaging radiation from solar flares and cosmic rays (SN Online: 5/24/16). Only astronauts on the lunar missions have gone beyond Earth’s magnetic field, and for only a handful of days. No one has spent as long as a year in that unprotected environment, let alone 2.5 years. One way to avoid such lengthy space exposures could be to develop new propulsion technologies that can get astronauts to faraway locations more quickly, says Markus Löbrich, a radiation biologist at Technische Universität Darmstadt in Germany who was not involved in the research on the Kelly brothers. While the NASA Twins Study is impressive, the work underlines the fact that we are not yet ready for longer-term space travel, Löbrich says. For NASA to be able to send people to Mars, he says, “they really will need to think about countermeasures” to the radiation.